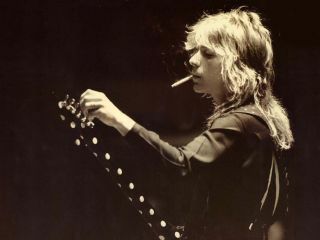 The long-awaited documentary about late guitarist Randy Rhoads is now available to preview. The 10-minute trailer for Randy Rhoads: Last Train Home (currently only a working title) can be seen below. Rhoads was the lauded guitarist in Quiet Riot and with Ozzy Osbourne, in the singer's early solo career. Rhoads died in a plane accident in 1982. The film has been two years in the making. Director Peter M Margolis says: "Two years is a very long time to spend shooting a film; however, not that long for a documentary of this nature. "This documentary has taken us across the United States more than once, as we have shot in New York, New Jersey, Florida, Nevada to name a few. In addition, we recently returned from England where we filmed Bernie Tormé, Lindsay Bridgwater, Johnny Cook, Chris Tsangrides, Pete Way, Lee Kerslake, Max Norman and a few surprise interviews. We also shot extensively at Ridge Farm studios where the band lived and recorded for long periods of time while the records were being produced."